This concludes my year-long biweekly studio blog. Thanks for your positive response to the details of my portrait process, inspiration and career achievements. If you are landing on this page for the first time, I invite you to browse the posts below to learn about my lifelong passion for portraiture. To receive upcoming studio news alerts as they occur, please join my e-news community. Ongoing insights can be seen on Instagram (@kimgorrasistudio). I look forward to sharing my story with you as the journey continues! By means of this trio of life-sized charcoal block-in sketches, I considered three lighting options for an eventual self portrait in oil. Identifying a subject's two unique and distinct shapes of light and dark is imperative to a solid painting or drawing. Posing myself in the mirror and using broad, simple shapes, I explored three possible light/dark patterns to see which had the greatest impact. Working in a broader sense achieves a clear and powerful light-effect while maintaining a likeness. This method of exploration is a fairly immediate way to problem-solve before starting the actual canvas. As a next step, these 5 x 7" grayscale oil studies were painted from life to explore the value range that each block-in lighting solution yields. It's impressive to see how front, three-quarter and rim lighting can vastly change the appearance of a single subject. The unified dark shapes cast by the three-quarter lighting solution (seen at center) provide solidity and interest. I recognized the success of this light/dark pattern and brought it to a higher level of finish. Eliminating detail at this stage emphasizes the general light-effect and affirms my intended expression of light on form. This grayscale study will help guide my value range when working in color on the final canvas and prevent my straying beyond the original vision. Painted in oil on linen panel, this portrait study measures 5.25 x 7". The final 36 x 48" portrait is currently on my easel. My portrait sitter is an elegant lady who is accompanied by her loyal terrier companion. Their natural pose fell in a striking composition. Exceptionally stylish, she sat for me at over 90 years of age. Known to scour clothing boutiques for vintage treasures, her style sense makes for a fantastic painting exercise in textures on the larger canvas. Her beaded necklace strands, chiffon scarf and metallic head wrap offset her wool suit and dog's soft coat. However, at the scale of this preliminary portrait study, such details must be reserved as flat shapes to emphasize the greater composition as a whole. In a previous blog post, I detailed my portrait sittings with notable Harvard Professor Arthur Kleinman. First unveiled in Boston at Harvard’s Department of Global Health & Social Medicine, the portrait now hangs in the University's new LEED-certified Tozzer Anthropology Building in Cambridge, MA. Shown at right is a moment from that encore unveiling ceremony. Also shown is the 5.75 x 7.75” preparatory head study of Dr. Kleinman that I painted from life in his office during one of our initial sittings. Such oil studies are a useful reference tool for me back in the studio while working on the larger portrait, as their immediacy helps capture the likeness and personality of my sitter. Working from life is fundamental to a solid drawing foundation. I have enjoyed this process for as long as I can recall. In fact, as small child I often drew portraits of my parents, insisting they sit before me live. 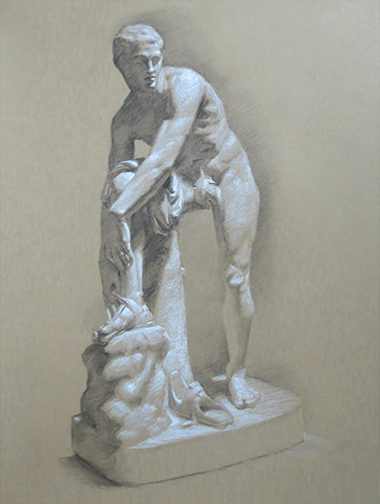 This cast drawing was created from life during my time as a student in New York. Rendered in charcoal and chalk, the 20 x 26" drawing depicts the Roman copy of the Greek Hellenistic sculpture, Hermes Fastening his Sandal. Classical art training in the academic discipline of live observation furthers one's perception of scale, measurement and proportion. These representational drawing skills allow me to realize my sitter's likeness in my portrait work. At the same time, by retaining a bit of my impressionist roots, I'm able to impart the feeling of my sitter's character and the energy they bring to the experience. This balance yields a portrait with solid structure, accuracy and vitality. In my mind, no artist is more skilled in the bravura manner of painting than American painter John Singer Sargent (1856-1925). Known for his bold, precise, economic brushwork, Sargent's oil paintings are simply breathtaking. His drawings and watercolors seem just as effortless. However, such results came from great deliberation, as Sargent was known to repeatedly scrape away his attempts until satisfied. Sargent was born in Florence, Italy in 1856 to American parents. He studied briefly in Florence before continuing his studies in Paris with Carolus-Duran at the École des Beaux Arts. He established himself as a premiere portrait painter of the upper class, often traveling between England and America for business. His U.S. commissions include the official White House portrait of President Theodore Roosevelt. Here in Boston, where Sargent had strong New England roots, the city proudly maintains a heavy presence of his work at the Museum of Fine Arts Boston (MFA), Isabella Stewart Gardner Museum, Boston Public Library, and The Clark Art Institute in Williamstown, Massachusetts. The Weymouth Art Association kindly asked me to conduct a live portrait drawing demonstration a few years ago. I was pleased to learn that the demo brought their largest event attendance of the year. Demonstrations allow me to present folks with an overview of my process. The event lasted two hours with a lecture beforehand and discussion breaks scheduled throughout. I used the three 20-minute work sessions to abbreviate a method that normally takes hours when working in the studio. To convey my approach, I: 1) established the initial placement of the three-quarter length seated figure, using the entire sheet of paper; 2) focused on the head to denote the separate shapes of light and dark, over which I; 3) introduced another level of detail and finish. I'd often visit extended family at what had first been my great-grandparents' home. Because the home's vintage 1930-1960's décor remained largely unchanged, I experienced the house as a thrilling time machine. I cherished the period upholstery, furnishings and natural light. This vintage charm inspires and informs my paintings, many of which are set in the rooms of this house using live models. These photos detail the actual room interior from my painting, My Aunt's Blue Couch. I suspect that some of my relatives view these pieces as old and tired, but to me they are magical. This judicial portrait study measures 5.25 x 7" and is rendered in oil on linen panel. The final 36 x 48" painting is currently on my easel. A posthumous endeavor, this portrait celebrates an accomplished fellow who immigrated to the U.S. from Italy as a young child. He worked to pass the bar examination at age 23 and later became special justice of the Municipal Court of Boston. As with my posthumous Bentley University portrait, I relied on my own visualization to compose the portrait setting and used live model stand-ins to achieve the proper drape of the robe. To suggest his story, the portrait includes the judge's favorite type of leather nailhead chair and a book entitled, "Italian-American Who's Who," in which he is prominently featured. Although I painted his portrait over a decade ago, I'm most often asked about my sittings with Jay Marsden, 4th-generation conductor on the Boston railroad. Commuters relied on his warmth and quick wit to brighten their trek in and out of city. He'd often ask passengers to choose an exotic dream location he'd then announce as the train's "final stop." At Christmastime, he was known to dress as Santa Claus and hand out candy canes en route! At the time of Jay's retirement in 2005 after 36 years of service, I was fortunate to paint his portrait and learn more about his amazing legacy. It was an honor to hold the heirloom railroad watches and keys that had belonged to his father and grandfather. Just before Jay's brother and fellow conductor Zeke passed away in 1991, the Massachusetts Bay Transportation Authority (MBTA) dedicated Engine #1921 in Zeke's honor. The engine made a fitting background for Jay's portrait. Jay is such an asset to the city of Boston, The Boston Globe ran a feature on his career to mark his retirement. I'm quite pleased to have had my portrait of him accompany that article, and am proud to consider Jay a friend. Those who feel his absence on the train should know that while Jay misses them, too, he is thoroughly enjoying his retirement! One of my chief painting heroes is American painter Elizabeth Sparhawk-Jones (1885-1968). Born in Baltimore, MD, she studied under William Merritt Chase at the Pennsylvania Academy of the Fine Arts, earning many accolades and awards. Shown above, her paintings Shoe Shop (1911) and Shop Girls (1912) demonstrate sheer mastery of bravura brushwork. She painted with great brilliance through most of her twenties, then suffered an unfortunate breakdown. She resumed her work upon her recovery years later, but her style became more raw and emotive. I've visited The Art Institute of Chicago to see the breathtaking Shoe Shop and was deeply moved. It was the only time I have overlooked the John Singer Sargent painting in the room! I first stumbled upon a note card of Sparhawk-Jones’ work over twenty years ago and connected immediately. Since there were no web resources at the time, I worked in close written correspondence with various museums and historical commissions to learn more about this incredible artist. These sources graciously supplied me with photocopies and other reference materials regarding Sparhawk-Jones’ life and work. Over time I have found others who also treasure her. In fact, author Barbara Lehman Smith recently published a book about Sparhawk-Jones entitled, Elizabeth Sparhawk-Jones: The Artist Who Lived Twice. Learn more about Elizabeth's amazing life at www.elizabethsparhawkjones.com. Although my efforts are still exploratory, I am passionate about sculpture and was thrilled to audit such a class in graduate school. Early in my painting career I didn't have frequent access to a live model. As a solution, I sculpted small heads from my own likeness and used them as reference for my figurative paintings. Some years ago I sculpted this clay self portrait from life while looking in several mirrors. Because the head measures just 2.25" in height, I chose to simplify form and detail. If I were to continue with the figure, I'd further build up the clavicle and other anatomical landmarks. Sculpting has made me a better painter with a heightened awareness of form and modeling in my 2-D work. I began this 5.75 x 5.75" head study in oil with faint notations of structural measurement. I often aim to establish overall shadow shapes before exploring areas of light. However, in this instance I worked from the forehead down to lay in direct chromatic patches of light and dark shapes simultaneously. These color-values established a simplified, yet accurate representation of the model in the initial pass. By sharpening key edges and softening others, the form began to advance, recede and take shape. My model was an elegant and talented graduate school friend who resembled a Greek statue come to life. I was thrilled to have her pose for me. I was fortunate to visit the White House during my recent stay in Washington, D.C.. Showcasing the iconic building's historic art and décor, the public tour encompassed a dozen rooms on the ground and state floors. Naturally, I was drawn to the presidential portraits and those of the first ladies. Among my favorites were John Singer Sargent's portrait of Teddy Roosevelt in the East Room and Anders Zorn's portrait of William Howard Taft in the Blue Room. The Entrance Hall featured both President Bill Clinton by Simmie Lee Knox and George W. Bush by John Howard Sanden. I was most thrilled to see the portrait of Ronald Reagan by my mentor, Everett Raymond Kinstler, hanging in Cross Hall. Kinstler's portrait of Gerald Ford graces the grand staircase of the entrance foyer. After graduating college years ago, I worked a stint at the Museum of Fine Arts, Boston. A chief job perk was the opportunity to spend lunch breaks sketching directly from my favorite museum paintings. At the time, most MFA-collection portraits by my heroes John Singer Sargent and Anders Zorn were housed in the upper rotunda, just outside the library. It was my favorite location in the entire museum. Since then, I’ve returned to the MFA with my sketchbook many times. Today I’m sharing one such museum sketch of Sargent’s 1887 Mrs. Edward Darley Boit (Mary Louisa Cushing), mother of the four daughters in Sargent’s famous 1882 painting, The Daughters of Edward Darley Boit. Perhaps the painter to whom I'm most drawn is Swedish artist Anders Zorn (1860-1920). Zorn's signature brushwork and limited palette are quite exciting to me. A talented oil painter, Zorn was also a proficient watercolorist, etcher and sculptor. Born in Mora, Sweden, he studied at the Royal Swedish Academy of Arts in Stockholm. He and his wife Emma lived in London and Paris before returning to their homeland in 1896. Zorn traveled abroad, painting family, friends and himself, as well as members of high society. In 1899, at just 29 years of age, he was awarded the Legion of Honour at the Paris World Fair. That same year, he was appointed by the Uffizi Gallery in Florence, Italy to paint a self-portrait for their collection. Zorn's portrait commissions include three U.S. presidents: Grover Cleveland for the National Portrait Gallery, an etching of Theodore Roosevelt (drawn from life at the White House) and William Taft's official White House portrait. Painted from life a few years ago, this self portrait was completed in oil on a 5 x 7 1/4” linen panel. I wanted to focus solely on the light/dark pattern and chose to paint in an open grisaille (griz-EYE). Grisaille originates from the French word gris, or gray. An open grisaille is a painting method that uses semi-transparent gray or neutral tones to establish initial shapes of light and dark (Painting in a closed grisaille carries forward with the addition of white paint to achieve an opaque, full tonal value range using monochromatic tones). Here, using a single paint value, I sought to capture accurate shapes of the light/dark pattern to achieve proper drawing proportion and likeness. I was excited to attend the Portrait Society of America's annual Art of the Portrait Conference, held last week in Washington, D.C.. Highlights included the Artist-to-Artist Face Off live portrait demonstration, which showcased the talents of fifteen accomplished portrait artists simultaneously, and breakout panels that offered painting techniques and business acumen. A personal favorite was a lecture by my mentor, Everett Raymond Kinstler, entitled, Yesterday is Tomorrow. Mr. Kinstler discussed the 150-year history of influence that past painting masters have had on the modern day. He spoke of such significance from Flagg, Cornwell and Johansen to Dumond, Sargent and Sorolla. Mr. Kinstler is a nationally-renowned portraitist and artist who has worked professionally for over 70 years. It is remarkable to realize his own direct lineage of study to the very masters he referenced. The Gala Banquet & Awards Presentation was a popular high point, at which the PSoA honored watercolor artist Mary Whyte with the Gold Medal for Lifetime Achievement. The event also announced the winners of the 2016 International Portrait Competition, with Michael Klein receiving the William F. Draper Grand Prize Award for his portrait, New York City Entrepreneur.